We handed our readers Apple on a silver platter yesterday, suggesting they look to the AAPL Weekly $195-200 Calls for opportunities, and those who heeded that suggestion were met with extremely pleasant results. Our success with options trading ideas has become so commonplace that we hardly need to mention that all three of the ideas contained in our targeted range produced excellent intraday moves. Apple wasn’t the only options chain we successfully called yesterday morning. SODA was the other highlighted play for which we signaled our interest, and it ultimately ended up as the NASDAQ’s #3 gainer of the session. We zeroed in on the SODA Weekly $99-105 Calls and two out of the three produced multi-bag moves on the day. The $100 Calls traded in a range from 4.42-10.30, marking a gain of 133% The $105′s fared even better, shooting up 200% from 2.00 to 6.00. For a fresh idea, we’re going to be looking at TSLA, which, despite a miss on Q2 earnings, is still gapping up here in the premarket. That’s enough to get get our attention here in the short term regardless of where the stock is ultimately headed . We’ll look at the TSLA Weekly $320-330 Calls as we head into week’s end, for potential quick strike trading opportunities on a dip-and-rip. Only seven trading days have elapsed since we slated some longer-term Apple options ideas for observation on the 1st of this month. We were looking at the AAPL 06/01 $167.50 & $170 Calls and we’re pleased to return just over a week later to report that AAPL has mounted a heck of a seven day upswing, facilitating some fantastic gains in our flagged contracts. So far the $167.50′s have traded in a range from 4.36-19.98, an increase of 358%, while the $170′s exploded 435% from 3.30 to 17.64. We also had some fresh options ideas in yesterday’s morning report, the TRIP Weekly $45.50 & $46 Calls. What we got from those, was a highly respectable intraday performance. The $45.50 Calls surged up from .85-2.30 for a single-session rip of 170%, and the $46′s ran from 1.35-2.77, a 105% pop. 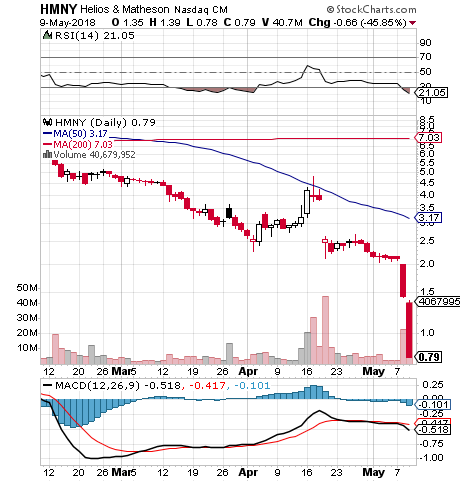 We want to place HMNY on intensive bottom watch this morning after noticing the setup on the chart. The stock has been absolutely punished over the past couple of trading days, and as you can see below, the RSI is now in heavily oversold territory. The last time the stock was this oversold, at the beginning of April, it recorded an upswing of over 100% so we’ll want to keep an eye on its activities. at least for the remainder of the week, and possibly longer. We began tracking some options ideas for AAPL on Tuesday morning when we slated the AAPL 06/01 $167.50 & $170 Calls for observation. Then yesterday, we followed up with another set of ideas based on the performance of the stock, signaling the AAPL Weekly $172.50 & $175 Calls. We’re happy to report that all four of the ideas we put forth for the Apple options chain have yielded excellent chances for quick strike profits. Beginning with the 6/01 $167.50 & $170 Calls – The $167.50′s traded up from 4.36 to hit 10.85, a rise of 149%, and the $170′s have run from 3.30-8.80 for a 167% swing. As for our followup additions from yesterday morning, the Weekly $172.50 & $175 Calls we were very pleased with the single-session moves made by those as well. The $172.50′s ran from 2.08-3.26 (+57%) , and the $175′s went from 2.37-5.45 (+130%). We also want to follow up with the other fresh options idea we placed in yesterday’s report, the MA Weekly $182.50-187.50 Calls, which all also posted some excellent multi-bag intraday gain chances. We like the setup of the current chart on BYOC, so we wanted to include this one as well. 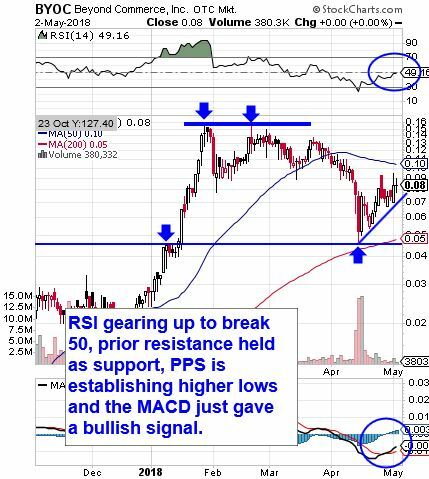 Its setup is currently sporting several key indicators that we always look for, and have also pointed out on the chart below. We’ll put the stock on watch in coming sessions; with a break past the current 50DMA of .10, things could get interesting. We noted the prior resistance around .16, which would represent a nice gain from current levels if the stock were to return there. To round things off with another successful stock call we made recently, we have EBIO, which we initially alerted on April 23rd at 1.86. Yesterday, after its fourth straight bullish session, EBIO hit 3.50, marking a move of 88% in just eight trading days.